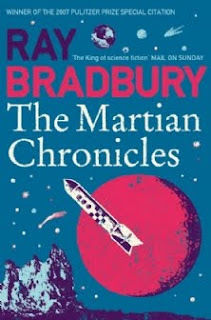 After reviewing The Martian Chronicles: The Complete Edition (here) I started to think about the evolution of covers quite a bit, especially those books that have been around for decades. 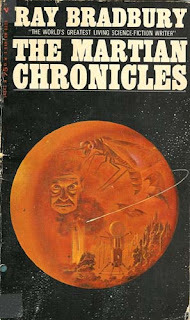 Below are a few examples of cover treatments given to The Martian Chronicles over the years, which include some beautiful and some not so beautiful versions. 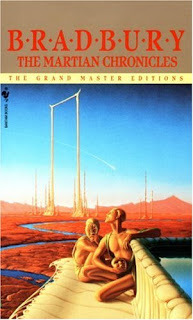 I've seen this listed as the first edition cover of The Martian Chronicles, but I'm not entirely sure if it is. I have to say it is one of my favorites though. The usual treatment of Bradbury's name and the coloration of the art are wonderful and set the tone for many other covers to come. This is the type of cover that never feels old such as the cover for Fahrenheit 451 that has been used for years. One of the worst version out of the lot, but it was a product of its time. A fairly basic design, but still a nice austere look. A pulp cover that looks designed for a young audience. Ohh, rocket ships! Very bland cover, but it definitely fit with the time period of 1960s movie posters. 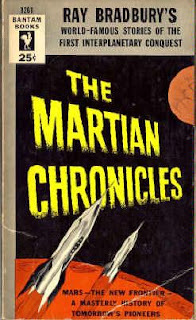 This is one of the few editions that show the Martians. It seems most of the covers want to show the human factor or some dry bleakness. Unknown Year, but I'd guess in the 70s or early 80s. Again another very bland version. For some reason his publishers' love showing a globe of some sort. 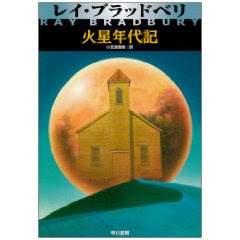 Believe it or not, but this is a very sedate cover for a Japanese edition. Simple and straight forward. Notice how the title is much smaller than Bradbury. 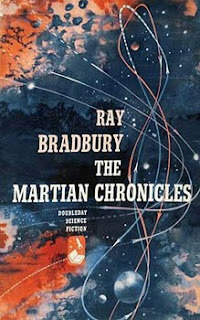 You can definitely tell that as Bradbury's fame grew so has his name on most covers. Makes me think of a more turn of the century type book. Overall, this is definitely one of the better covers. It does a good job of giving you an alien feel yet some how homey. So which one's do you like or hate? 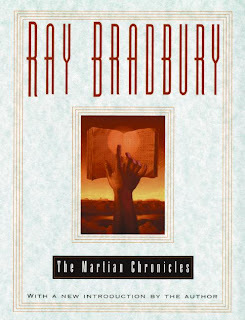 About a year and a half ago, I bought a Flamingo imprint edition of The Martian Chronicles, which apparently is from 1995. (Flamingo itself was shut down in 2004.) This poorly done scan of the cover shows 1) just how bad the cover art is, and 2) the truth in the adage of "Never judge a book by its cover." @JDsg That's definitely one of the worst versions I've seen. Even low-rez I can imagine the horror. I should add that the Subterranean Press cover is merely one created for the ARC. The actual book won't have a dust jacket. @Sub/Bill Thanks for clarifying. I know you were taking opinions on whether the final would have a jacket or not. I think for a limited edition like this it is best to go sans jacket, but you still managed to create one of the best covers this book has ever had. Love the 1958 cover by Robert Watson. Very mystical. The original of that painting is owned by Ray. The primary colors are blue and grey with dark blue skies. Doubleday insisted on the "red planet" colors but the original painting is beautiful. 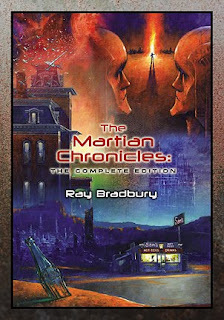 Robert and Ray reunited in 1998 and made hundreds of prints of the original, signed by Robert Watson and Ray Bradbury. I like the Flamingo cover. It is clearly a depiction of Hieronymous Bosch's 15th century painting of Eden, The Garden of Earthly Delights.